For most of Miami's history, its economy has been based on tourism. In fact, it was not so long ago that the city came to life only during the winter months when tourists from cold northern regions flocked to its beaches, hotels and resorts. That phenomenon is no longer the case, as tourists visit the region throughout the year. In 2013, over 14 million overnight visitors came to Greater Miami, infusing the local economy with $11 billion in direct expenses, such as hotel rooms, restaurants, shopping, transportation and attractions, and another $5.5 in indirect expenditures in such areas as real estate, medicine and retail. The consistent tourism market has undoubtedly aided in South Florida’s recovery from the 2007 housing recession. In addition to its leisure draw, Miami's access to Latin America has made it a top international banking and investment center, with most bank offices located in the city's financial district along Brickell Avenue. Today it is home to the international trade divisions of a number of major U.S. banks. The city's financial institutions have won important business in connection with economic development and privatization in Latin American countries. 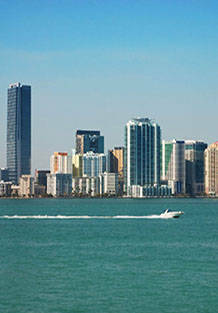 Miami’s economic outlook looks quite positive for the foreseeable future. Read more about the city’s dramatic rise in summer tourism.